On March 18, 2019, Russian President Vladimir Putin is set to travel to Crimea and visit cities of Sevastopol and Simferopol to mark the fifth anniversary of of Crimea’s reunification with Russia - the day Ukraine’s Black Sea peninsula became part of Russia. 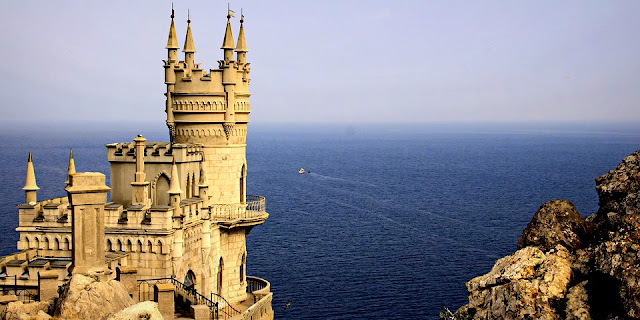 The Kremlin's press service issued a statement on March 17, 2019; "On March 18, 2019, Russian President Vladimir Putin will visit Crimea and Sevastopol" - marking five years since Crimea "rejoined" Russia. However, Kyiv and the West slammed the move as an "illegal" annexation, leading to sanctions against Russian individuals and entities. During the visit, Putin will receive reports about the launch of the Balaklava and Tavria thermal power plants and participate in the unveiling ceremony of the Port electric substation in the city of Taman via videoconference. Both the power stations were at the center of an international scandal after German conglomerate Siemens said its power turbines had been installed there without its knowledge and in violation of EU sanctions banning the supply of energy technology to Crimea. In Moscow, city authorities are organizing a street festival a stone's throw from the Kremlin called "Crimean Spring" that hosts jazz concerts, cooking workshops, and a photography exhibition. On February 27, 2014, heavily armed men wearing green uniforms with no identifying insignia stormed the regional parliament in Simferopol, the capital of Ukraine’s the Crimean Peninsula and raised the Russian flag atop the building. On March 18, 2014, Putin signed a treaty that Moscow claims made Ukraine's Crimea region part of Russia after Russian forces seized control of the peninsula. There were few casualties during the annexation. But, the exact number is difficult to determine, but even Ukrainian sources mention fewer than a dozen dead or missing servicemen and activists. On March 27, 2014, the referendum was rejected as illegitimate by 100 members of the UN General Assembly. By a recorded vote of 100 in favour to 11 against, with 58 abstentions, the Assembly adopted a resolution titled “Territorial integrity of Ukraine”, calling on States, international organizations and specialized agencies not to recognize any change in the status of Crimea or the Black Sea port city of Sevastopol, and to refrain from actions or dealings that might be interpreted as such. Since 1999, Putin has dominated politics in Russia for almost two decades, serving as president or prime minister in a rotation. Particularly, Crimea's controversial accession to Russia bolstered Putin's domestic standing, boosting his approval ratings from 60 to over 80 percent. Russian experts called this the "Crimea effect." In March 2018, when Putin was re-elected to another six-year term — he obtained more than 75.01% of the votes (12% more votes than 2012 election), after counting 50% of the votes cast. But recently, Putin's public approval rating has seen a slump over the past few months amid strengthened western sanctions and the announcement of reforms in the country's pension system. Some analysts said that the decline of Putin's ratings is partially due to the controversy around raising the retirement age and the value-added tax (VAT) rate that came into effect on January 1, 2019. In Crimea, people are coming to terms with Russia. According to Tatiana Senyushkina, a political scientist at the V. I. Vernadsky Crimean Federal University, "Five years have passed and the situation has stabilized, people are now adapting to their new environment and its new laws and political culture." She cited mass Russian investment into infrastructure projects including a US$ 3.6 billion road-and-rail bridge linking Russia and Crimea, a new highway network and a new airport as having increased living standards and incomes across the board. But, the international opinions on the annexation is quite the opposite. And, it resulting in constant pressure build-up. On March 15, 2019, the United States, together with the European Union and Canada, imposed new sanctions on more than a dozen Russian officials and businesses in response to the country's "continued aggression in Ukraine." The US also imposed sanctions on two Ukrainian separatists — Aleksey Naydenko and Vladimir Vysotsky — involved in organizing November elections in the breakaway Donbass regions (Donetsk People's Republic and Luhansk People's Republic), which Washington says were a "sham". On March 16, 2019, Deputy Spokesperson for the U.S. Department of State Robert J. Palladino tweeted "Russia's so-called 'referendum' at the barrel of a gun in Crimea five years ago was a farce rightfully condemned by the international community. Crimea is Ukraine." Russian Foreign Ministry said in a statement released on March 16, 2019, that it will respond to the new anti-Russian sanctions introduced by the European Union (EU) against Russian citizens in connection with the incident in the Kerch Strait. In response to that, Federica Mogherini, European Union foreign policy chief said through a statement issued on March 17, 2019, "The European Union reiterates that it does not recognize and continues to condemn this violation of international law... It remains a direct challenge to international security, with grave implications for the international legal order that protects the territorial integrity, unity, and sovereignty of all states."